You can now jump directly from the filtered inventory to a matching report. All chosen filters will be kept. Your three most used reports are shown right next to the inventory, matching the selected Fact Sheet type. 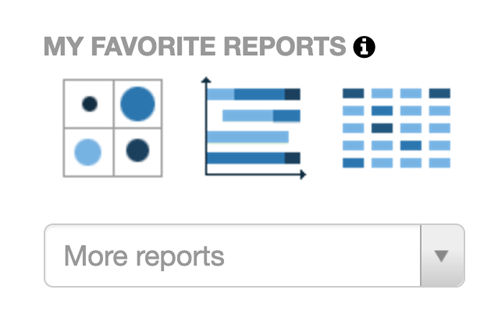 If you want to jump to a different report, just select “more”. The report shows up with chosen filter criteria. To better match each companies use case, the filters and config settings of all default reports can now be adjusted by the admins. This can be very useful for example if you want to change the default view in the application landscape, select another axis in the matrix report or pre-define a different filter. As an admin just change the report to your needs, and then use the button Save in the top-right menu. The timespan of the Application and IT Component Roadmap report can now be defined with the Lifecycle filter. When you are in the Roadmap report select “in time frame” in the lifecycle filter facet and choose a timespan. 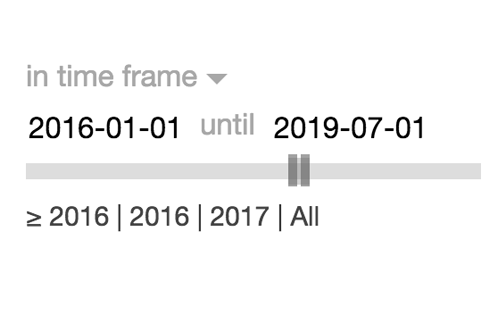 This timespan will automatically adapt the timeline of the roadmap report. 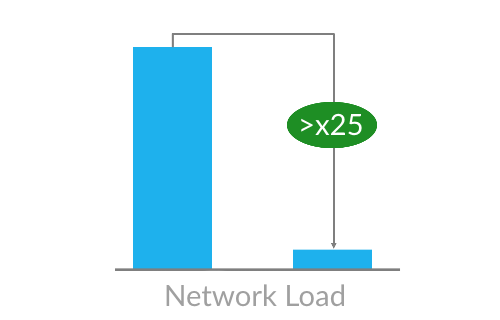 By intelligent compression mechanisms we could reduce network load by the factor 25. This allows for significantly faster access via the API and has further improved performance, especially in workspaces with large amounts of Fact Sheets. Slack is a great way to bring all your communication together in one place. We at LeanIX love Slack and use it for communication across our teams. One great use case is, to let everybody know when there are updated to the LeanIX Inventory. 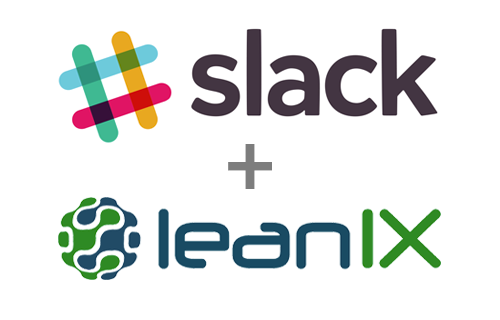 LeanIX and Slack can be integrated easily using our flexible Webhooks architecture. Read this article on our new developer portal to learn how you set it up in 5 min. The filter facets on the left side in the IT Inventory now also include locations. This addition is useful to drive forward cloud migration or to ensure compliance with data privacy laws: In which location are my software, hardware and services operated? Which data privacy laws are applicable? When designing a survey, you define a filter to select Fact Sheets and you set roles to determine the recipients. Now you can check the included Fact Sheets and recipients before running the survey by clicking of the shown numbers. Once the survey has started, you can view the status by Fact Sheet and recipients by clicking on the date of the run. Free access to information and contribution by the community are core concepts of LeanIX. However, there are a few Fact Sheet types, such as Business Capabilities or User Group structure which create a common language across the user community in LeanIX. Therefore as an admin you can now decide in the customization, if the Fact Sheet type should be editable by admins only. Still, your user community can continue to contribute by adding comments or subscribing to the Fact Sheet. 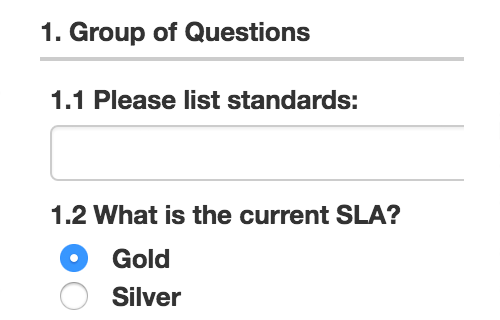 Our Survey Add-on has received some new power-features: Questions can now be put into groups. 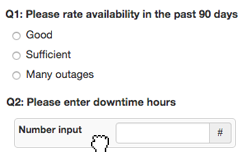 Also, you can now use the result of a calculated field and store it in the Metrics-store. 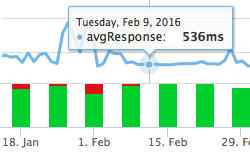 This means you can display the results of your survey as time series via the Metrics Add-On. 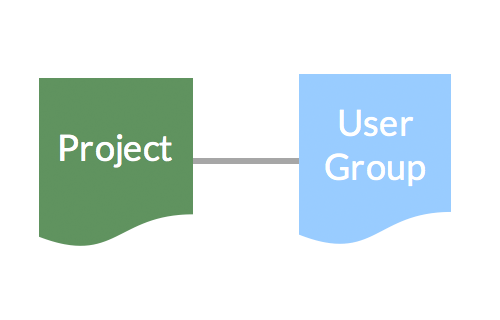 You can now track the dependencies of Projects and User Groups, giving you the chance to find out for example, which User Groups will be affected by a change in a Project Lifecycle. The relation needs to be enabled by the Administrator in the customization of the Project and User Group Fact Sheets. All Fact Sheets can now be filtered by their Hierarchy Level in the IT Inventory: This enables for example to display only the first level of your Business Capabilities. Also we have added a filter facet for the „Requires“ and „Requires By“-relation. When you export your data as an Excel Sheet, tag groups are now exported in separate columns. That means you can now easier filter by a specific tag group in Excel and you can identify much quicker, if the tags for each tag group have been set. Administrators can now create API tokens which are used to access the LeanIX APIs. The advantage of using the new API token over an API key is that for every use case a dedicated token is assigned and an expiry date can be given. 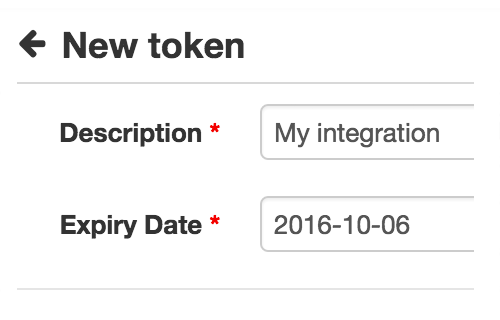 We have migrated your API Keys to API tokens with expiry date in 3 months. Please make sure you use API Tokens from then on. Thanks to the new partnership with BDNA, it is now possible to integrate Technopedia into LeanIX. This constantly-updated library categorizes more than 1.2 million products. With the help of the integration, IT Components in the LeanIX IT Inventory can be linked to their corresponding entries in Technopedia. The product lifecycles of Technopedia are then used in reports, e.g. to show the technology risk over time. 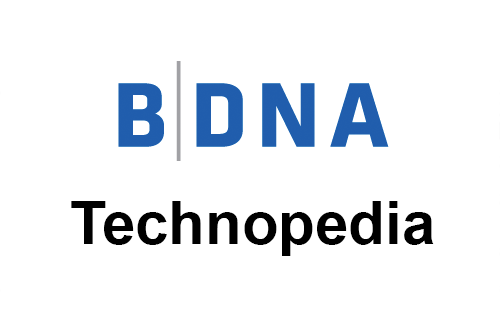 Customers can buy the access to Technopedia directly via LeanIX or at BDNA. We have now introduced additional password rules that comply with the rules of the BSI (German Federal Office for Information Security). For all customers not using Single-Sign on, that helps to keep high security standards, i.e. new passwords require extra safe combinations of characters or passwords expire after 180 days. Customers can now choose between the default rules and the BSI compliant rules for their account (Please approach LeanIX Support). Classifications such as Business Criticality were reflected using numeric constants in the Excel import and export of the IT Inventory. Now you can use self-explanatory values e.g. MISSION_CRITICAL. For a better understanding we have added a tab „Readme“ in the exported Excel file to explain all the fields for the import, e.g. to indicate which fields are read-only or which values are allowed. The new LeanIX add-on puts real-time information in context of IT architecture. Customers can freely define own metrics and upload their data, e.g. about availability of systems or numbers of users, via the REST API into the high-performance database. LeanIX provides Open Source SDKs in multiple programming languages. The first three metrics are free for LeanIX customers (with a limited number of data points). The quality seal has received a couple of improvements: Notifications are sent out to all responsible and accountable persons of a Fact Sheet, either when the quality seal was broken by another user or when the Fact Sheet was not updated during a longer timeframe. It is also possible to approve or break the seal for all Fact Sheet of a defined type, e.g. after the initial import. Often it is very beneficial to know early when an application or technical component runs out of support. LeanIX sends an intelligent reminder three months before a Fact Sheet changes from one phase in the lifecycle to another and it provides an update immediately after a change. This is how you always stay up-to-date. In the inventory it is now possible to filter subscriptions also by their role. Using this mechanism, it is for example possible to find out all applications, where a specific person is the application owner. Not only the classification of accountable, responsible or observer can be used, but also user defined roles. The new year brings great visual updates: Tags now show the associated color and indicate the tag group as optional prefix. Tag color and the tag group prefix can be set in the administration in the section custom fields. To see your reports in full beauty, you can now switch to full screen in the top-menu. LeanIX automatically keeps users up-to-date when something important happens in the IT inventory. E.g. you can let LeanIX inform you if somebody edited a Fact Sheet for which you are responsible or if somebody added a comment. Every user can define individually, when a notification should be sent out via email. The application landscape was rebuild from scratch and has improved in many dimensions: It has a significant better performance with hundreds and thousands of items, you can configure it and select by which relation to cluster (e.g. 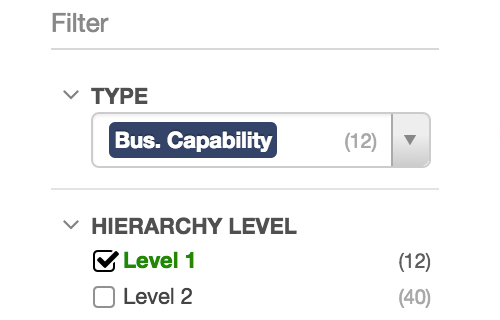 by User Groups or Processes), you can select how many levels of clusters (e.g. Business Capabilities) you would like to see. Additionally the legend now always stays on top. Now the relations of the matrix report are shown in the Fact Sheet. For example in the application Fact Sheet at each business capability entry it is displayed for which user groups this relation is valid. Furthermore the relations are editable directly in the matrix. It was never easier to keep other applications in sync with the LeanIX inventory: Just create a new webhook in the administration (API & Integrations) which is triggered in case of events such as creation or update of a Fact Sheet. No more dump polling for updates. 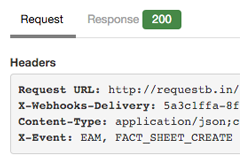 You could use the free service RequestBin during development to see what LeanIX sends out to the webhook receiver. More and more customers extend their use cases and integrate 3rd party applications with LeanIX. 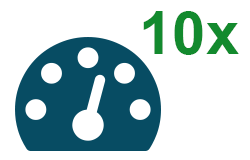 Therefore we have significantly improved the performance when creating and updating Fact Sheets using the REST API. Reading from the REST API stays at high performance thanks to our intelligent search index in the background. Entirely new workflows are possible now: Periodic IT security checks, data quality improvements, or user satisfaction polls, just to name some. A survey is easily designed via drag and drop. Questionnaires can even be addressed to recipients, which are not users of LeanIX. See this presentation for details. The management of interfaces now benefits from the functionality of all other Fact Sheets: Flexible filtering in IT inventory, export and import via Excel, classification via Tags, subscriptions of users and many more. All existing data is preserved. In addition we added labels to the Data Flow in the Visualizer. See this presentation for details. 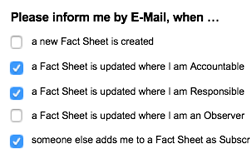 All Fact Sheets can now be cloned with a single click. This speeds up creating new versions of applications, because all information is pre-filled in the new Fact Sheet. During cloning you can already link the new Fact Sheet as a successor of the existing one. The matrix report is a powerful way to visualize how well the business is supported by IT. We now even allow to show, how that evolves over time: By changing the axis to time frame, you immediately see when applications go out of life or their underlying technologies become a risk as they are no longer supported by the vendor. It is now possible to import applications into LeanIX from your own Excel sheets. This also includes linkage to the business capabilities the application supports. You can also use this feature to import successors. Administrators are now able to archive tags. Archived tags cannot be assigned to new fact sheets but can be removed from facts sheets they have been previously assigned to. If users try to add a new tag with the same name as an archived one, an error message is displayed. Sometimes customers want to display some of their reports in customized dashboards. It is now possible for dashboards developed by customers to be integrated into LeanIX, some customers have already successfully done so. Contact us if you are interested in integrating a dashboard for reports in your LeanIX workspace. Data security is of paramount importance to LeanIX: After all, our customers trust us with their valuable data every day. Thus we are extremely pleased that the well-known German technical certification authority TÜV Saarland has certified our data security after a thorough examination of our processes. The certificate confirms that LeanIX meets all legal data security requirements. 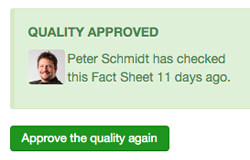 When a new comment has been added at a Fact Sheet, all subscribed users are now notified via email. It is also possible to mention another user by using his email address, e.g. to foster exchange on a specific topic at the Fact Sheet. The same mechanism of mentioning a user also applies for comments at reports. Confluence is a professional wiki platform. It can be used to collaborate on writing and sharing content in a team. The Confluence integration enables LeanIX users to publish their reports on as images on their Confluence wiki. A link back to the report in LeanIX is automatically added to easily navigate back and forth. The Excel-Import in the inventory now allows to delete Fact Sheets just by adding an extra column 'Action' and adding the value 'Delete'. When updating rows, now only those columns are updated, which are included in the Excel sheet. For workspace administrators it is now much more efficient to maintain the user list. 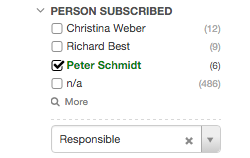 The new user admin allows to search for name, role or status. Additionally it is now possible reinvite users directly from the administration. In case the invitation mode 'Confirmation' is enabled, invite request can be approved or rejected directly from the admin. Two other reports for Projects and IT Components complete the Matrix reports for project portfolio or technology management. 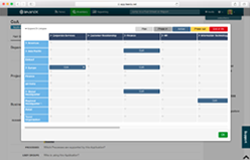 All Matrix Reports can be configured: in addition to the selection of the axes it is possible to restrict displayed content on the axes. To improve the usability of LeanIX even further, we have again added further optimizations: Assigned tags are now visible at relations in a factsheet. In the Inventory and the Reporting new filter factes for e.g. Business Criticiality are available for applications. The colors of Fact Sheet Labels can be adapted flexibly in the Professional Edition. Cost information can be restricted in their visibility to specific user roles. In the Visualizer all layouts are completely flexible adaptable. This includes the use of any available icons to e.g. create a UML diagram. The existing SSO-implementation was extended for usage with Microsoft Active Directory Federation Services (ADFS). This results in more comfort for the user, as the company-wide password can also be used to login at LeanIX. For the company the security increases, because access rights are now controlled centrally such that additional administration efforts decrease, e.g. when an employee leaves the company. All reports can now be exported comfortably in a variety of formats and sizes. 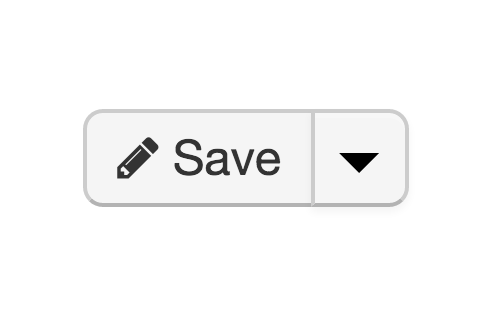 In addition to PDF you have the option between PNG and SVG or paper sizes ranging from A4 to A1. Moreover, it is possible to adapt your layout to portrait format or landscape. The filters set before and the views will not be changed thereby. Your reports can be reused quick and easy either as a separate PDF document or as a graphic in a presentation. You can bring all reports generated with the visualizer up to date. An intelligent mechanism identifies changes compared to the actual status in the inventory and shows if for example the name of a fact sheet or the direction of an interface has changed. Changes can be accepted (“refresh”) and saved – either under the actual or a new name. The "Business Support Matrix" allows you to analyse how well your Applications support your Companies' Business Capabilities for the different User Groups. Easily identify white spots or redundancies. Maintaining the matrix is so convenient: Just add or delete allocations directly in the matrix and apply filter or views to highlight different aspects. 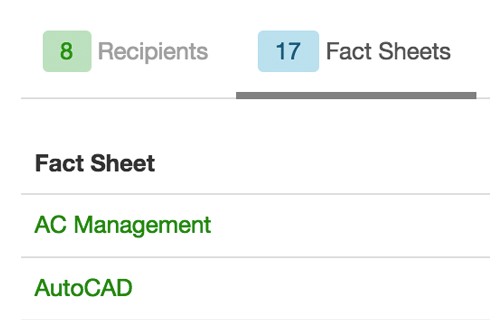 The field "Jump to a Fact Sheet" in the top-menu can be used to easily access Fact Sheets. We have improved this function: a new algorithm provides a better ranking of the matches. Navigation to fact sheets is now easier and faster than before. Flag each interface with an individual status: planned, active or sunset. This enables you for example to maintain interfaces, which are not yet active but which are already planned within projects. Dropdown fields in Fact Sheets now take tags into account when navigating through the dropdown list. As a result these fields are more convenient, as you find your choices quicker than before. The new visualizer allows to extend the existing set of best practice reports. You can create custom visualizations such as a data flow or dependency diagrams. This is just the start, more to come soon. See this presentation. Every report in LeanIX can be tweaked to your demands, e.g. by filtering or setting a view. Now you can save your personal reports and share them with other users (available with Smart, Pro or Ultimate edition). Switching between the different aspects of a Fact Sheet now becomes much easier: While you are scrolling through the information, you can directly jump to comments or have a look into the history. Jumping back brings you to the place you left. 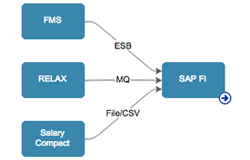 Did you ever want to filter your applications by the top-level business capability? Would you like to know which applications are used in the region tagged with “DACH”? The updated filters now allow you to do this. See this presentation for more details. With LeanIX a company-wide platform for IT management is established, which many employees from IT or business can access. To ensure highest security and best usability, single-sign on (SSO) can be used. The existing credentials for all other company applications can now also be used to enter LeanIX. Integration via SAML or LDAP is supported. In accordance with our philosophy of a modern IT management ecosystem data from ARIS and Jira can be processed in LeanIX. 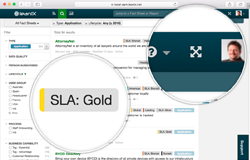 View the open and resolved issues from JIRA in LeanIX. Processes and links to applications can now be easily synchronized using the ARIS interface. LeanIX offers editions and modules for various use scenarios to allow an individual use for any purpose. These settings can now be viewed and adjusted in the lewnIX administration. You can now easily adjust the selected edition, e.g. by adding further modules. There is hardly a suitable tool to perform application management in a professional and economical way for smaller companies. We offer a Starter Edition, which covers exactly these needs and grows with your future needs. And that at an unbeatable price of 299 € per month. Keep evaluations on IT objects easy and clear. LeanIX classifies data objects according to ISO 27001. Providers can be rated according to criticality and quality. Users can review single services. 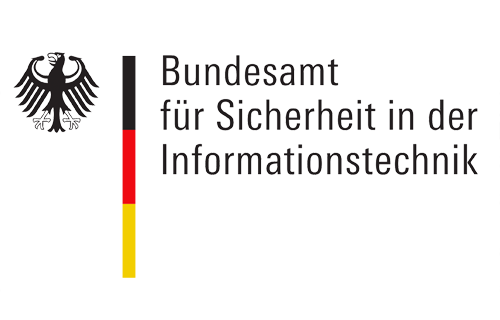 LeanIX relies on German data protection law. Since our servers are exclusively operating in Germany only German data protection law applies – also for all relevant subcontractors. We have used Christmas break to further improve the performance. The result: LeanIX has now a plus of more than 30% in performance. You will experience it directly when using LeanIX. Often you need to know ad hoc changes within a given time frame. This can be interesting for planning purposes to show future investment needs. The only thing you need to do is planning the lifecycle in Fact Sheets. Wherever smart search filters are available you can perform this powerful analysis. Every IT Component can bear the exact location. Check in which regions services are provided, where your data centre locations or physical assets such as servers are. Identify whether 7x24 throughout different regions business critical applications support can be ensured. You want to make sure that the provided data you are working with are reliable. The check seal shows you the actual status. A red bell means that this Fact Sheet should be checked. This can be the case if somebody not responsible changed information or the quality check duration has been reached. You can set read-only access for users, define the visible scope of a Fact Sheet and set a calculation rule for calculating completeness for every Fact Sheet Type. We have been asked to allow adding of persons to Fact Sheets without inviting them as a LeanIX user. It is now possible to assign a LeanIX user to a Fact Sheet and to add any person to Fact Sheets. In the subscription area you can add a project stakeholder or an important customer or provider contact to the Fact Sheet. To set business criticality, functional and technical fit was not easy to do because of long descriptions for each entry. This is history. We switched to a more intuitive use without losing the qualitative value of these fields. And we added an assessment to every User Group to make a judgment for the Functional Fit for this particular Application. As an Administrator you will experience some more changes in the Administration: a better User Management and the option to define a set of roles users can choose for subscription. The User Management now better serves the management of the number of licenses, the status of a user and switching of user rights. You can now filter the content to your specific needs in a very comfortable way. This feature is provided in Inventory and Reporting. There is no need to learn an artificial query language.You should be familiar with this kind of filters from many other applications be it linkedIn or Amazon. This is called facetted search. The left sidebar contains context sensitive filters. All chosen filters are shown in the power filter bar. But this is not all. You can directly remove or set other filters by using the intelligent auto completion, just enter a character and possible filters are displayed. Views provide another look at the data. It can be a color code change but in some reports such as the Roadmap it provides drill down details. 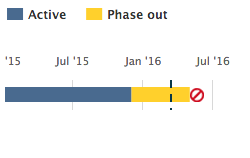 In the Application Roadmap View you have already seen the Successor view that shows the successor of an application. Now you have the possibility to see any related Projects or even IT Components Software, Hardware and Services). 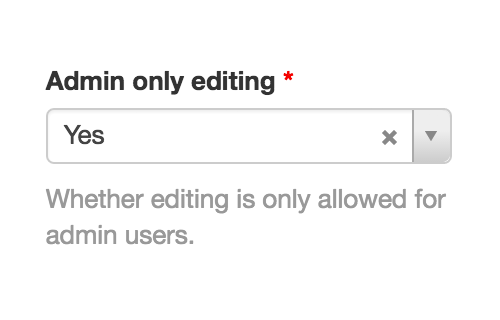 We have included the capability to add Custom Fields in LeanIX. 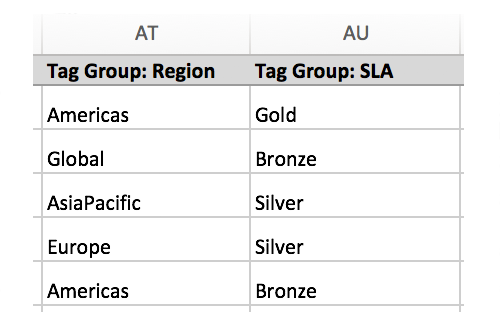 As a starting point this is possible for tag groups which act like selection lists. You can add such fields on the fly without any programming need. All custom fields in 1.5 are instantly available as a filter and in report views. 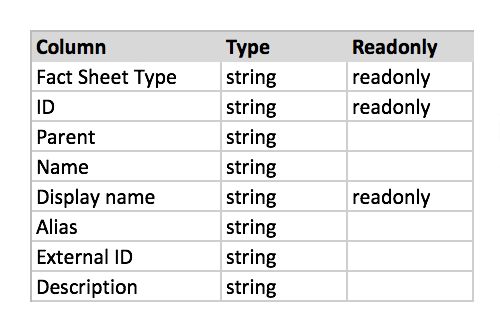 You can define what type of Fact Sheet a specific custom field belongs to. Besides slight design enhancements of the user interface we have put effort into effort into improving overall usability. The selection of My Fact Sheets or All Fact Sheets is now a global setting and will stay this way until next change. We added printing to Inventory and Reporting. 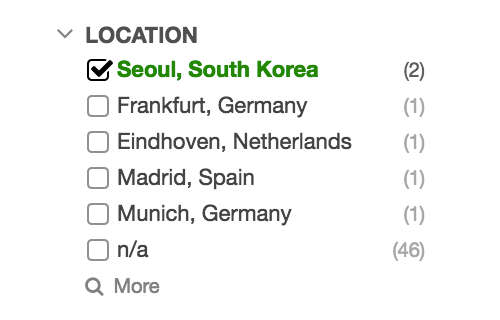 The User Group Location Report can now be zoomed into the regions. Our reporting engine enables us to continuously extend the design and filter options in LeanIX. Additionally to the existing, we introduce following new reports: Interface Landscape, Application Portfolio Analysis and Lifecycle Metrics. LeanIX’ reports provide new possibilities of interactive analysis, so it is easier to sturucture the fact sheets and highlight only information that is relevant for you. You can now: select between different perspectives, adjust the coloring according to criteria, select your view based on a certain point in time, and intelligently zoom and filter. LeanIX performance is improved by 25 % through a reduction of its source code and an extension of dynamic loading. Next to these advantages, we optimized the usability of LeanIX: Forward and back navigation will not lose filter settings, the prior view will now be saved. Newly added tooltips provide a preview of the details of links to other fact sheets, so there is no need to jump between the fact sheets. 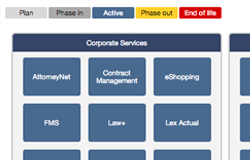 LeanIX enables to show the successors at the end of the lifecycle of an item, e.g. 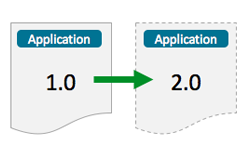 a migration of one application to one or more applications. The timing and arising dependences are presented in the reports, so impacts are directly visible to all employees. Businesses use LeanIX through so-called workspaces, where their IT data is securely stored. For big businesses it is useful to display their IT landscape in more than one workspace, e.g. categorized according to different business divisions. Users that are working in more than one workspace (e.g. from the headquarter) can easily switch between the workspaces. The report-area has been optimized to allow faster access to the needed report. To achieve this, a simple menu has been introduced, which provides four main groups: Metrics, Cost, Heat map and Roadmap. Switch from one report to another with a few clicks only and see more than before with an enlarged report area to facilitate the analysis. If you are using different terms in your company than LeanIX provides out-of-the-box you can adjust these as an administrator. For example: in some companies IT Applications are called IT Systems, for others IT Products. By using the terms and definitions which are established in your company the rollout and adoption of LeanIX can be accelerated, because everyone will recognize the terms they are used to. With this release users with Internet Explorer 8 will fully benefit from the great user experience in LeanIX. We have improved the support for IE 8, since a lot of companies are still using it as their standard. We strongly encourage you to work with a more up-to-date browser (whenever you can). LeanIX now supports you to keep track of your expenditures in your projects. For each project you can reflect the total budget, the service providers which support the project and the applications which are affected. With the comfortable status reports, you always have a qualitative and quantitative snapshot of the project. You will be able to quickly identify budget overruns in your project portfolio. All data entries are optimized for the ease of use, in order to keep the maintenance effort at a minimum. In the IT inventory you can now easily search across the descriptions of all fact sheets. Because our search is as simple as searching the web, everyone will quickly find their answers. A full-text search can of course be combined with the intelligent search options (our facetted search). In addition to the most secure password hashing method bcrypt, LeanIX now also encrypts all key user data in its database (e.g. E-Mail address, First Name and Last Name) with a strong public key method. Now, nobody with direct database access such as an administrator can read user related information. LeanIX differentiates between the roles Workspace Administrator and Workspace Member. Naturally the first user will be defined as Workspace Administrator. A Workspace Administrator has a trustful position as he is responsible for the Workspace and can therefore execute more functions such as full data export or blocking of users. At the time of inviting new users a Workspace Administrator can define the Workspace role of the invitee. As invitations are basically not restricted we offer an additional check point by choosing the opt-in method in the Configuration Options of the Workspace. Some of the Fact Sheets have been adjusted to better follow the source, make, deliver model. New Fact Sheet types are introduced: Technology Stack, IT Component and User Group. With the IT Component you can now build a perfect view on your used HW and SW technologies as well as Services you buy. LeanIX does contain all information which are relevant to take ad-hoc decisions and stay agile. In some cases it may be necessary to complement LeanIX with some more information already stored somewhere. Now you can virtually integrate into SharePoint by embedding a document link to a Fact Sheet. All related information are at hand in one place. And this is not restricted to SharePoint, every valid URL is accepted - such as Websites, File shares, etc. The hero unit of a Fact Sheet is completely redesigned to even better foster collaboration. Now it is possible with one click to see all subscribed users with their Fact Sheet related role and find relevant experts, browse through or add a comment. All data in LeanIX are your data and you should always be able to do what you want and need to do with it. Therefore we provide a well-structured Excel-Export. Based on this export you can create individual reports and perform individual, complex analysis. All Exports will be controlled by a Workspace Administrator. Additional reports based on user feedback are always part of our Roadmap. Find now reports related to the new IT Component Fact Sheet: IT Component Roadmap and IT Component Release Standardization. These reports enable you to better manage lifecycles of technologies, create a Technology Roadmap or reduce the complexity driven by multiple releases operated in parallel. 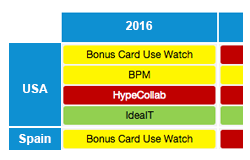 The new Application Roadmaps can be visualized in the IT Product Roadmap Report.